This past June 24th marked the 25th anniversary of what is arguably Mel Brooks' last top-notch comedy, a final hurrah before we were subjected to the mediocre Men in Tights and the downright depressing Dracula: Dead and Loving It. It's only appropriate that a movie featuring an ode to merchandising would line up a new release to celebrate the quarter-century mark, even if they did miss releasing it on the actual anniversary by a month or so. Yes, the Spaceballs: 25th Anniversary Edition Blu-ray is set to hit shelves on August 7th, and we've got a trailer to get you in the mood. 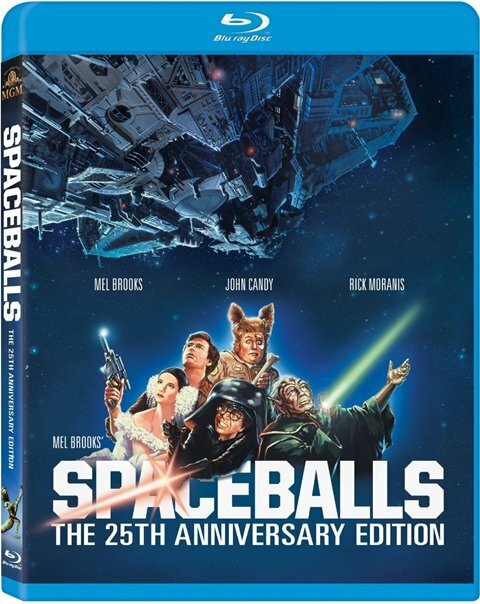 The 25th Anniversary Edition features over five hours of bonus features, including a new "Spaceballs and the Skroobing of Sci-Fi" featurette, a Mel Brooks commentary, costume and art galleries, and the inevitable bloopers. The disc retails for $19.99, but it's still available for pre-order over at Amazon for a mere $14.99. That's a deal even Skroob could appreciate.